CBC Premier leaders Wadsley Bridge Pheasant came from behind to claim a share of the spoils with a 1-1 draw against second place Wickersley Youth. Wickersley started the game the better and deservedly took the lead through captain Kris Lee-Green. The second half started with Pheasant looking for a way back into the game and a slip by the Wickersley defence allowed Dylan Parrott to take advantage and level the scores. A Sam Scrivens hat-trick and singles from Lewis Dickinson, Jack Moore and George Orrell saw Penistone Church to a 6-0 victory at Hallam and up to fourth, while Redmires moved up to sixth as Tom Whiting scored four in a 9-1 rout of Woodseats Club. Although a Dale Kay strike briefly put Woodseats back in the game and it was just 3-1 at half time, their defence in the second half found the pace of the Redmires attack too hot to handle and along with Whiting, player manager Dave Knaggs and Chris Cottyn both grabbed two and George Rudd one. Liam Paterson, Alan Mowforth and Ben Pyle goals put Norton Oaks A ahead three times against Civil Sports A, but each time the lead was cancelled out by Josh Corker, Gaz griffiths and Thomas Bamford strikes and the two sides had to settle for a point apiece from a 3-3 draw. That result allowed Handsworth Old Crown to put a bit of distance between themselves and the bottom three as they beat Intake Old Boys 2-1. Matt Ellis and David Sills were both on target for Crown, but the goal of the game was scored by Intake’s John Hills. It’s as you were in Division One with the top four all winning. Brad Bowland hit a second half hat-trick as Norton Sportsman stayed top with a comfortable 10-4 win over bottom club Civil Sports B. Other Sportsman scorers were Chris Lewis 2, Callum Frith, Chris Winters and James Archer, Mark Fereday and Jack Waymouth. Josh Buxton, hat-trick, and James Hall, for Civil. Woodhouse Village held onto second place with a 5-3 home win over Ranch. On gtarget for Village were Ryan Simmonite Nicky Haywood, Theo Wilson, Oli Grady and Perry Jackson. Ranch scorers were Tom Burns, Mickey Thomas and Chris Wajs. Chapeltown RBL stayed third with a hard earned 2-0 victory over a Norton Oaks. Oughtibridge WM remain fourth after their 3-0 victory over a Southey Social that had seven players missing. Josh Walker, Tunnard and Matt Harrison the marksmen. Cotts FC took another step towards safety as a Michael Blythen hat-trick and singles from Kieran patterson and Salem Hizam gave them to a 5-3 victory at relegation threatened Brinsworth Phoenix. Phoenix scorers were Karl Fox, Jordan Pearce and and Richard Ellin. Cobden View are also seven points from danger after their 6-2 victory at a Colley that could be just two more defeats away from the drop. Josh Limbrick scored just before half time to give View a half time lead, but Colley started brightly in the second half and Christopher Onjia deservedly drew them level. Cobden got a penalty and Joe Taylor scored to put them ahead, but Colley responded and Ian Sharland hit a shot from 40 yards into the top corner. Cobden took the points with a second from Limbrick, two from George Wilson-Bland and one from Aaron Ellis. Despite a Danny State goal for the home side, Division Two has new leaders after an own goal and a Matt Owen goal gave Crookes FC a 2-1 win at Mosborough Whites. Mosborough Reds did much better as Jay McFadzean scored four in a 5-3 win at previous leaders Wadsley Horse & Jockey. 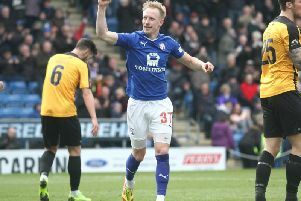 Niall Wilkinson gave Jockey the lead and although McFadzean cancelled it out from a Ross through ball, Sam Civil netted to give Jockey a half-time lead. The second half belonged to McFadzean - he equalised again before completing his hat-trick from a Sherritt through ball. Josh Smith scored direct from a corner to extend Reds lead, before keeper Adam Ledger saved a penalty to stop Jockey pulling one back. Leon Dearns hit a third for Jockey but any hopes of a point ended when McFadzean saw the keeper off his line and scored his fourth from the half way line. The division’s last unbeaten record was ended as Steve Brammer and Michael Towey doubles helped Royal Earl to a 5-0 victory over Boynton Sports. Connor Chapell scored Earl’s fifth. Fourth place Forum made no mistake though as Jav Sherratt scored twice in their 5-2 victory at Woodseats Chantrey. Joseph Thompson and Andy Harrison gave Forum a two goal lead before Danny Lonsdale pulled one back, but two from Jav Sherratt and one from Josh Gibson made Josh Connelly’s first ever goal for Chantrey just a consolation. Woodhouse Juniors gained their first away win of the season as Henry Bradshaw netted twice in their 3-1 victory at Shakey. Sam Ledger netted Woodhouse’s other while Joe Woodhouse netted for Shakey.